This post was first published in July 2012. It makes for an interesting comparison with most recent ridership stats. Auckland public transport patronage totalled 71,087,755 passengers for the full 2011/12 financial year to June 2012 an increase of 5,324,100 boardings or +8.1%. June monthly patronage was 5,613,682 an increase of 45,648 boardings or +0.8% on June 2011. Rail patronage for the full 2011/12 financial year to June 2012 achieved 10.9 million passengers, +10.5% on the previous year. The Northern Express bus service carried 2,279,860 passenger trips for the 12-months, a growth of + 10.8%. 36.33% of the 43,300 match attendance for the 9 June 2012 All Blacks vs Ireland Test at Eden Park used special event public transport services. Total patronage for the year has increased by 8.1% which is a pretty spectacular result, especially compared to motorway volumes which remain flat (e.g. traffic on the harbour bridge is down 0.5% compared to the period last year). Here are the main graphs. Perhaps the most concerning thing is the continuation of a recent trend of weak rail patronage, trips were down -5.5% compared to June last year. AT note that there was one less business day and that this year there was a full Queens Birthday shut down compared to only a partial one last year and that these account for a difference of about 6.7%. They also note that while sales of normal tickets have increased, there has been a reduction in the number of student tickets sold over the last 6 months. Lastly the poor recent patronage obviously has AT worried about what will happen in September and October. The annual results still include the additional patronage from the RWC which is estimated at 192k for September and 210k for October and as these months roll around it is likely to appear that rail patronage has dropped off. Unfortunately we still get the self reporting of the bus companies suggesting that they have up to 99.89% punctuality and it’s interesting to note that the ferries are reported this way too. And while it isn’t really public transport, I like having the cycle counts included in the report. 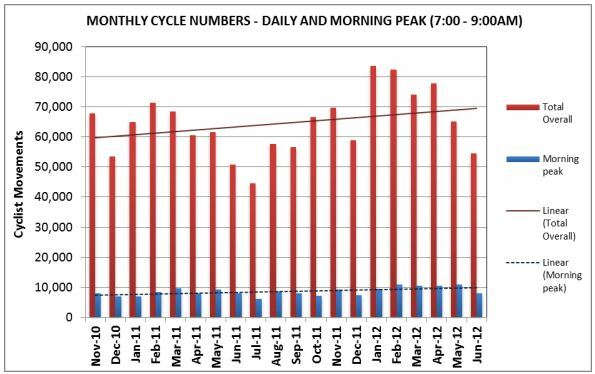 These show that compared to June last year, cycle trips are up 7.7% (the numbers re taken from automatic readers on a number of routes. Interestingly the report mentions some preliminary results from the annual modal share study which looks at how people get to the CBD. Its good to see another increase and when walking and cycling are added in I would suggest that over 50% of people are not arriving in the CBD by car now. That trend will only continue as we improve our PT services. Mode share comparisons into the Auckland CBD between use of the private car, public transport, walking and cycling are surveyed annually in March by Auckland Council. This is undertaken between 7am and 9am. Provisional summary results show a trend of 44.3% (2009), 44.0% (2010), 42.4% (2011) and 45.5% (2012) for public transport mode share. The Ronwood Avenue car park opened on 18 June 2012. So far, only a handful of cars have started using the car parks. The daily tariff is $7.00. Is this the article that got posted last week and then quickly disappeared? I was wondering what happened to it. Posting today makes more sense as we get the comparison with the June 2017 figures. Yes it’s great to have the comparison. 71m PT trips to June 2012. Now 88m PT trips to June 2017. And if our forebears had managed things better, based on the 1940s per capita PT ridership, that would be 628m PT trips (using 400 PT trips per capita and 1.57m Aucklanders). “Unfortunately we still get the self reporting of the bus companies suggesting that they have up to 99.89% punctuality…” Glad those days are long over! Have observed better much OTP on the bus network over the last couple years (particularly on non-NZ Bus operated routes). NZ Bus still has a lot of work to but thankfully they operate less routes than they used to.